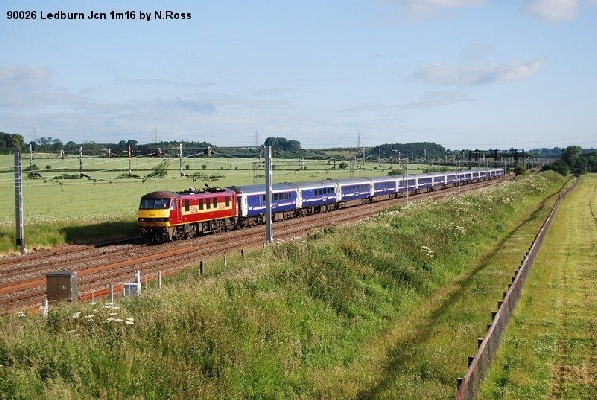 This loco started her career in the late 1980s working a variety of passenger trains on the West Coast Main Line for the former Intercity operator under British Rail until spring 1997. She then transferred to Virgin Trains when the route was privatised. Awaiting departure from Stratford with an express service from Norwich to Liverpool Street. 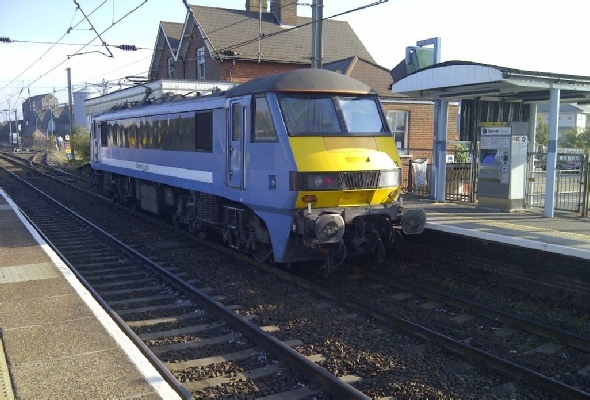 The photo was taken on the day the class 90s entered their 22nd yr of passenger operations. Another picture of 90002 paired up in multiple with 90019 at Rugby on 6L48 this time from a different angle and looking rather clean. The NXEA class 90 returned north on 6X41 from Wembley to Garston. In a rather tatty “One” livery, 90002 stands at Norwich after arriving with an ecs from Crown Point just before 6am. The 90 then went onto work a service to London. Standing at London Liverpool Street looking rather clean after returning from an overhaul programme at Crewe, 90002 awaits departure with an express train bound for Norwich. This is a rare shot of 90002 paired up with 90019 pausing at Rugby at the helm of 6L48 from Garston to Wembley.The NXEA 90 was on test prior to being released back to TOC following overhaul at Crewel. A final shot of 90002 this time clearly showing the two pantographs up on the pair of the 90s at Rugby on 6L48. Not the best the picture in the world, so apologies in advance.